Kossi Efoui is an African playwright, journalist and novelist, born in Togo in 1962. In the early 90s, he took part in a non-violent movement against the regime: he had to escape his Country and, since then, he has been living in France. Thus, in his novels and plays, the most recurrent themes are the conflicting memories of his Country, the complex feelings of the exiled, the seeking of a new identity, the critical reflection on the role of African writers who live abroad after their Diaspora. 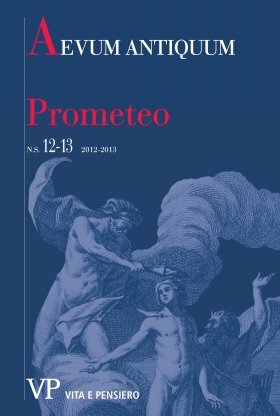 Io (tragedy) (2005), in particular, freely adapts in the poetic form of a song, or prayer, the episode of Io in Prometheus Bound (see especially vv. 807-852): the story of her pilgrimage and sufferings, before she delivers in Africa her son Epaphos, entwines with the anonymous voices of contemporary African women, all victims of wars and ethnical conflicts, especially those who nowadays wander pregnant through the continent, after they have been abused and raped. So, the tormented Io may also be read as the personification of Africa as a whole. And the prophecy uttered to her by Prometheus, who promises her peace and bliss in Africa, may give hope to all these women and to their sons: born from violence, and yet loved as a promise of a better future for their mothers and for Africa.